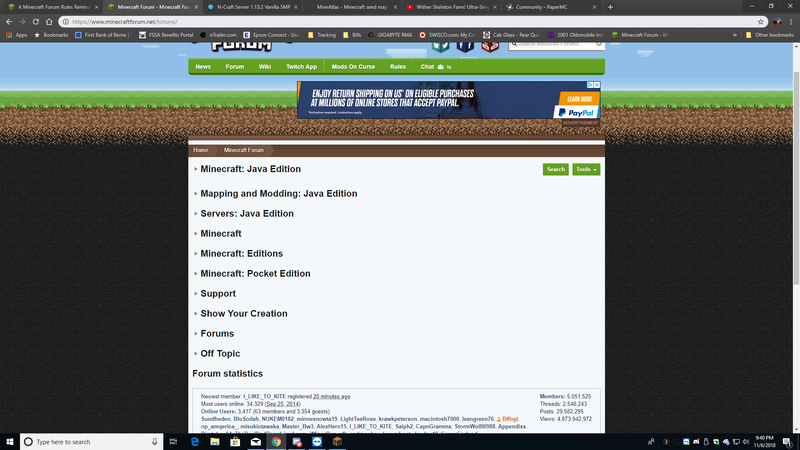 I suggest you to post Rules Tab just at very top category above "MineCraft: Java Edition" just so that everyone can see it and understand the rules. Why? I didn't know there were such rules in certain areas. I only read the rules that were within sub category of PC servers. Until I found out. So please. this is more than suggestion.. really a must have so everyone can see the rules as soon as they clicked "MineCraft Forums". I'm a little confused as to what you're suggesting, although it seems helpful? There is already a general rules tab on the top toolbar, and rules for each section can be seen at the top of the section. I'm not entirely sure what you're asking for. Also, this should have gone into forum discussion. Its not good enough. I been warned for something that didn't exist in PC Servers rules. So all of the rules should be in each place or at once place at very start of forums. end of story. IF this was my forums. thats where it would be so ppl can see it and not miss it at all. I am not sure whats confusing about it. If you do not agree with a warning you were issued, you are allowed to appeal it. In the PM that you got when you were warned, there is a link in there that explains how to appeal it. Our rules are located in the Nav Bar at the top of the page under "Rules", which then has links to each section's own specific rules. In each section as well, there is an announcement that's pinned which also directly links the section's rules. For a guy like me is not good enough. I am sure you guys have warned many and still don't get the rules until you post the link. Just cause it says Rules at very top in small letters that people can miss it easily. You need Bold letters to them to make it an eye catcher. I'm still confused but I have to admit the rules are a bit hard to follow, especially as to which level of forum they are applying to. Does anyone have a diagram of this on them? EDIT: By follow, I mean understand where to apply to, not to actually abide by. There are global rules and sectional rules. The global rules (liked in the "Rules" tab in the navigation) apply across the forum, the sectional rules apply just to their section. For example, if you're posting in the Support forum then you are to follow the global rules and the Support rules. Some sectional rules can overrule the global rules (e.g: in the support forum you are allowed to bump every 12 hours). Why don't you re-read the entire thread sir. So there's no third level of rules for the subsections then, correct? E.g. in Minecraft:Java:Seeds there are the global rules and the rules for Minecraft:Java, but no specific rules exist for :seeds, just whatever in the Minecraft:Java section that happens to mention that subsection? There might be rules for a subsection, e.g: Seeds, but if they are they will be listed in the sections rules. An example of this is PC Servers, which includes rules specific to Server Recruitment, Minecraft Server Hosting and Clans. Subsection rules will always be listed in the rules for that section, so if you're in Seeds for example and want to know if any rules apply to it then you can look at the top of the section for any Rules announcement ("Minecraft Discussion Rules") and see if "Seeds" is listed in that announcement -- which it isn't, so we can conclude there are no specific rules for the Seeds section and you are only subject to the global rules and the Minecraft Discussion rules. Nope, that explains it all quite clearly. Thank you, Citric! This could save all Admins/Moderators a lot of reports. Meaning.. less reports to go through when this suggestion does take affect. There is a difference between knowing and not caring. A lot of the time, it's because they don't care it's a rule. We had tried using more visible prompts when you first registered that said to read the rules, however it did not do much. In the PC Server section, bumping has always occurred, no matter the visibility of the rules. It is generally a *lack* of wanting to read them unless you are made to because you were told you broke them, such as your case. Moving buttons around isn't going to help in this case. Especially considering it's already in one of the top areas, having "categories" for it (which quite frankly, doesn't mean much to me in what you mean) won't solve it. We are not able to do UI changes. So, if you have better ideas which don't require changing the UI to achieve, then we can consider those. Quite frankly, this doesn't provide any value. Our report counts are already low enough that it's not a big deal. And I'd prefer having more reports than none, because then I can easily clean up stuff, instead of having to manually go into every thread looking for anything. I'd prefer more reports, so this isn't a downside to me.